This 1/4 carat engraved heart bridal ring set in 14K yellow gold is abundantly adorned with elegant emblems of love, allowing this pair of rings to serve as a sweet symbol of your endless love. The bands of both the engagement ring and wedding band display these emblems of affection, framed by fine milgrain edges for a touch of elegance. These hearts point toward the round quarter-carat prong-set diamond that presides in sparkling fashion over this 14K yellow gold pair. 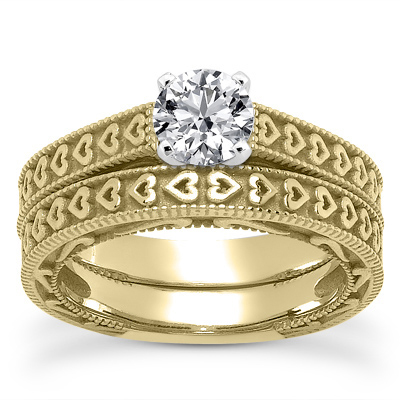 A 0.25 carat diamond is set in an engraved heart bridal ring set in 14K yellow gold. Apples of Gold Jewelry guarantees the 1/4 Carat Engraved Heart Bridal Ring Set in 14K Yellow Gold to be of high quality and an authentic engagement ring with real diamonds, as described above.